This poem and fragrance may seem at first like unusual companions, but there is subtlety and grace to my reasoning. Jane Kenyon’s poem is a quiet decent into death, shadows shifting, light stretching, and time inevitably moving toward darkness. I have been haunted by it ever since I first read it many years ago during a brush with severe illness. It affected me profoundly. Each verse adds more details - dew, crickets, stars, an abandoned hoe, a bottle in a ditch, air in lungs, a scoop in the oats, light and foxes. These quiet things are settled, in repose as darkness comes. The picture painted is one of shimmering suffused rest. But there is comfort in the creeping shadows, an inevitability of solace in obscurity and shade. 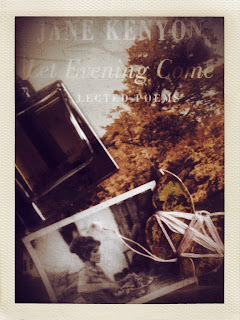 Let evening come. I am ready. I am rested. When I read this I wonder… what will I remember as evening falls, the great highs and lows, the operatic passions and sexual dramas that shattered the peace of random seasons. Will it be faces, in rooms, endless rooms, lit by joy and regret? Or will it be the detail, the minutiae. The scoop in the oats, the bottle in the ditch? Candles on strewn student floors, a Paris polaroid on a table, cigarettes in drunken fingers. The scent of beeswax and oakmoss on sleeping skin, a cat asleep in moonlight, shoes on a crumpled bed, a Highland lake, safety pins in a broken shirt. Random details. Shrouded in dusk. Warmed through with the comfort of letting go. Of faith in something, even if it is just the knowledge of finality. Reading this again I knew I had found my scent for Let Evening Come, a sweet brooding aroma to drop into, like arms and kisses in the darkness. The enhanced cocoa note in Dior Homme Intense floods the senses with drama and detail. The original fragrance by Olivier Polge changed the face of men’s scent forever. It is perhaps one of the most beautiful and enigmatic men’s fragrances of the last twenty years. On a visit to Edinburgh Bertrand Duchaufour said it was the fragrance he would have loved to have made. Praise indeed. So many sweet, powdery men’s scents have followed, but none of them have ever come close to Polge’s original. Patrick Demarchy reworked Dior Homme for the Intense version. It has been re-formulated and this has split the Intense lovers. Some love the remix, others hate it. Wearing the scent again reminds me how delicately the notes are assembled. There is space in between the accords and facets, allowing the senses to breathe and absorb the beauty. I have always admired the stillness of this scent. There is a tremor of something in the background. Something coming, but it is so hard to discern edges in the falling darkness. I always have her poems by my bed. Her work is balm and solace.